Why Colombia? The simple answer is: it’s a vibrant country full of educational opportunity, rich culture, and warm, hospitable people. Colombia also stands out because of its current economic growth, political stability, and caliber of its higher education. Additionally, interest from US students in volunteering and studying in Colombia has increased exponentially in the last 5 years. CEA’s expansion into Colombia is just the start of our initiative to help students Step into the Unexpected. We are excited to be at the forefront of making Colombia an accessible study abroad destination. 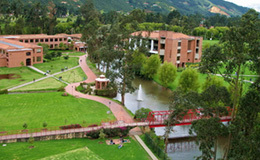 Located just north of Bogotá, Universidad de la Sabana, our new partner in Colombia, holds the High Quality Accreditation rating from the Colombian Ministry of Education. Its lush campus is reminiscent of a traditional US college and brings a familiar feeling with its many meeting points, various food courts, sport facilities, free clinic, libraries, and modern classrooms. 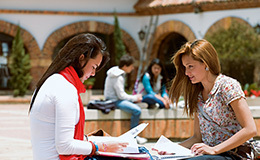 US students without proficiency in Spanish will find navigating the campus and connecting with peers easy, due to the Universidad de la Sabana’s requirement that students must be fluent in English. Our programs in Business & Marketing and International Relations & Communication offer courses taught in English by qualified Colombian and international faculty. 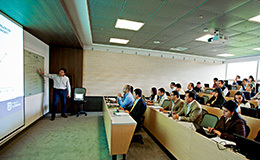 Students can expect small class sizes and a similar style of pedagogy to their home campus. 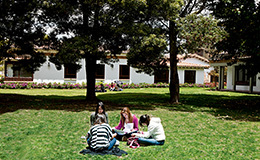 And with housing situated in the northern neighborhoods of Bogotá, students will experience the perfect balance between cosmopolitan and collegiate life. Did you know that Colombia has a Level 2 Travel Advisory from the U.S. State Department — the same advisory as France, Spain, the U.K., Germany, and China? Student health and safety is always at the forefront of our work. CEA conducted extensive, on-the-ground research and vetting of the city, university, housing, and excursions before choosing Colombia as our newest destination. The recent press coverage on Colombia is spot-on: the country and the capital have transitioned into an era of peace, security, and renewal. Some of the most rewarding experiences in life can be found when taking the road less traveled, and in today’s international education scene, that road leads to Colombia. We look forward to working with you to help your students step into the unexpected abroad. CEA’s domestic and international teams thoroughly enjoy getting to know our university colleagues in person and providing them with valuable professional opportunities. We invite you to join us next year at the following meet-up events. Our spring Advisor Workshop takes place in Phoenix, AZ from February 5-8, 2019. Nominate yourself or a colleague by October 15 to participate in this special opportunity for professional development. CEA covers the cost of your shared lodging with a fellow attendee, most of your meals, airfare, transportation, and social activities. All you have to do is come and participate! This workshop gives you the chance to network with your peers from across the country and learn more about CEA’s programs, our pre-departure process, how to support students through reverse culture shock, and more. For the full details on next year’s spring workshop and access to the nomination form, click here. Experience CEA program destinations from the student perspective on one of our Familiarization Trips. Take a tour of our classrooms and student housing, meet some of our students and faculty onsite, observe classes, learn more about what CEA offers students, and enjoy the city with colleagues. We design our FamTrips to give our university partners a firsthand look at student life abroad and to answer any questions you might have about our programming and services. Our first FamTrip of 2019 will take you to Paris and Aix-en-Provence in the spring, a beautiful time to visit France. The trip is scheduled for the week of March 31-April 6, 2019. Please apply by November 15, 2018. Join us in Spain for our second FamTrip of the year, October 13-19, 2019. We’ll be visiting Granada and Madrid, two cities with robust and unique personalities. The deadline to apply for the Spain 2019 FamTrip will be May 15, 2019. The trip price includes your airfare, accommodations, several meals, cultural activities, and transportation. "I was fortunate enough to be able to attend both a familiarization trip with CEA to Buenos Aires, Argentina and to attend their Advisor Workshop. I now consider CEA one of my top two providers because of their academic rigor, health and safety support, and the response time by their staff in Arizona and around the world. The behind-the-scenes access to these programs really provided me with the networking and information I needed to feel extra comfortable and confident in sending my students on CEA's programs." We hope to see you in 2019 at one of our meet-up events, whether in the States or abroad. If you have any questions, please reach out to Ashley Benoit. One of the most rewarding things for CEA about our internship program is seeing how it changes our students’ lives and futures, as they make an impact on communities around the world. For so many of them, an internship abroad turns out to be much more than something to list on their résumé. The following three internship alum stories illustrate what we mean. Lauren Dell’Arciprete did not end up where she intended, and it was the best thing that could’ve happened to her. When she started looking at study abroad programs, she wanted to go to Australia, but CEA took her to Italy. She arrived in Rome thinking she would be a Red Cross intern but completed her internship at a local organization she’d never heard of called Mio Fratello e Figlio Unico. This proved to be a match made in heaven: Lauren got to do the kind of work she wanted and came to a new understanding of her career path. When she began her internship, Lauren thought she wanted to be an occupational therapist, which is why she was excited about working directly with special needs children at MFFU. She had the chance to treat some of her patients one-on-one, felt like part of a family in the workplace, and improved her Italian language skills enough in eight weeks that she made her farewell speech in Italian. Since returning from Rome, she’s decided to pursue her Registered Behavior Technician certification instead of occupational therapy, and she has officially accepted the job offer MFFU made to her at the end of her internship. That’s right: they liked her so much, they want Lauren to work for them full-time! Lauren will now work on finishing her degree, getting a visa and preparing her move to Italy. Anthony Rotolo had just the kind of internship abroad experience he was hoping for when he started talking to CEA. Our team found him a marketing position at a small wine store in Florence, Italy, where he enjoyed the family-feel and learning about wine. With just three co-workers, including the business owner, Anthony was thrust into a position of responsibility that exceeded his experience and skills. He was asked to handle the company’s marketing during a period of business transition, trusted with its fate—and he rose to the challenge, developing self-confidence as he watched his ideas being implemented. Through his internship abroad experience, Anthony discovered what he’s capable of, and as a Business major, that confidence and comfort with taking charge will serve him well throughout his career. Olivia Bracy discovered her love for helping others in high school, when she started volunteering. This propelled her to join a community service sorority at the University of South Carolina, helped motivate her to go abroad, and ultimately led her to realize what she wanted from an internship placement, as well as her career. The coaching CEA’s internship team provided Olivia during the pre-departure process made her realize she was in the wrong major, and with the team’s support, she figured out she wanted to explore Human Resources through her internship, not her original major of Supply Chain Management. CEA found Olivia a placement at GOAL Global in Dublin. The HR internship in a non-profit organization proved to be a great fit for her. She returned from Ireland with the clarity she needed to change her major and redirect her future career path.